Khan is an incredibly muscular son of Henry, with great width over his plates. His dam Dainty D1 is one of our top performing cows with her daughters amongst our best young cows. His EBV’s are equally as impressive with EMA, Retail Yield, TI & SRI in Top 10% with growth in Top 20%. He was the first Henry son sold at auction and was Champion & Top Price in Dungannon November Sale selling for 3000gns. C16 was sold for £12,000 in Summer 2013 at seven years old setting a new record price for a female sold in the UK. She is sired by Udel 1 Vindicator and out of a Dendor 1 Sinner cow. She was sold with her 4 month old heifer calf K27 at foot who is sired by Panmure 1 Henry. 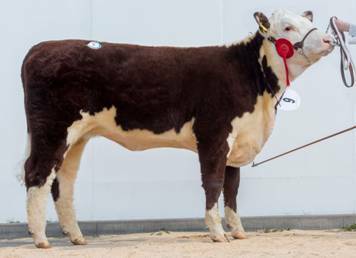 Her son Hero was sold for the top price at the Autumn Sale in Hereford 2012 and a full sister J11 is retained in the herd. 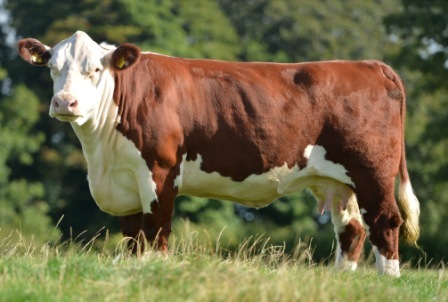 C16 was flushed to RLOA Dynasty 37U & Dorepoll 1 93N Nationwide, with calves due Autumn 2013. Karate Kid sold to Oyston Estates, Lancashire for 10,500gns setting a breed record only to be beaten 3 lots later by Kitkat! See a video of him sell here! Another son of the prolific bull breeder Dainty W7, Bonanza, Cantona both sold to pedigree herds, Firecracker exported to Spain, General, Reserve Champion Premier Sale 2012. 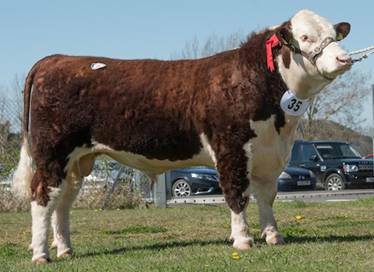 Landmark was Reserve Male Champion at the Spring Show & Sale selling to Vexour Herefords for 8200gns. He was the best autumn born bull calf in the NI Herds Competition . In the Top 1% for IMF, scrotal size and EMA, a huge +4.3 (average 1.3) Our 3 Henry sons averaged £10,325. 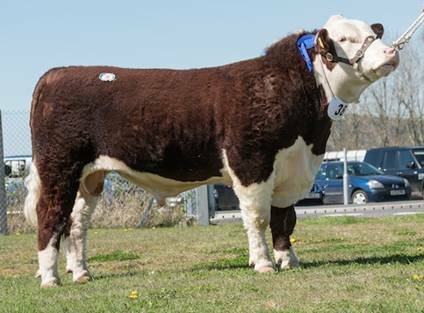 Our other bull entry was Lamborghini who sold to Tymawr Herefords, Anglesey for 4800gns. This 13 month old was a full brother to Ferrari sold to Genus and stood 2nd to the Champion. Kitkat is a record breaking son of Henry!! 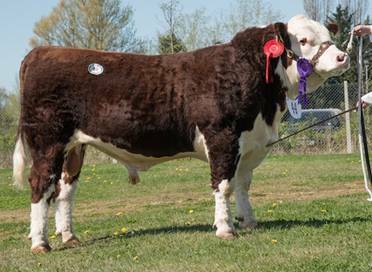 Selling in the April Spring Show & Sale in Hereford for 10,800gns to Nesbitt Farms, Berkshire for their Cleland Herd. View a short video of his last few bids here! A Superior Carcase Sire with EBVs for Eye Muscle Area & Retail Beef Yield in the top 1% for the Breed and TI & SRI in the top 10%. Out of the Dynamite daughter Dainty G2, a combination that’s really working, we await September to have some of his calves born in our herd. Lively was a 1st prize winner and is a full brother to Khan, the first Henry son sold at auction and was Champion & Top Price in Dungannon November Sale selling for 3000gns. His dam Dainty D1 is one of our top performing cows with her daughters amongst our best young cows. His EBV’s are equally as impressive with TI & SRI in Top 10% and he sold to pedigree and commercial work with the Boley herd, buying their third stockbull in succession for 2900gns. Landini was our other entry, he stood 2nd to Lively and sold for 2500gns. Another Henry x Dynamite son, his dam was unbeaten as a calf.